CROATIA, a tiny East European country with a population less than 50 lakh, and an economy that is ranked 77th in the world, has become the toast of the world (to be someone who is especially well-liked, regarded, or admired by all) for its outstanding performance in World Cup football, making its entry into the final and winning adulation (excessive admiration or praise) of people across the globe. For a country whose people number far less than any big Indian city, its sporting achievements far outstrip (move faster than and overtake) India’s, though it may lag behind India in GDP and economic growth. Croatia won five gold medals in the last two Olympics, just one less than what India has been able to manage in all the Olympics put together. 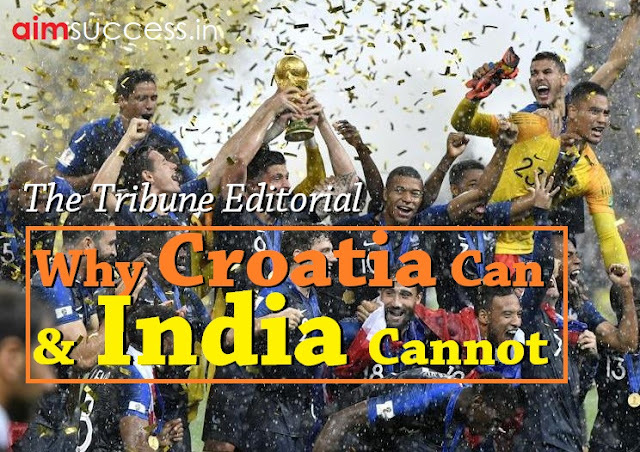 Why is a country like Croatia, ravaged (severely damaged) by war that resulted after its separation from Yugoslavia, managing to produce world champions and emerging among the best in football, whereas India is languishing (losing or lacking vitality) at the 97 rank? The way Indian football is stagnating (to cease to flow or move), or maybe crawling upwards on this steep and long ladder, even another 100 years may not be enough for it to qualify for the World Cup, let alone win it. Similar would be the story in the Olympic Games, where India does win an odd medal or two, but to compete with top nations and finish anywhere in the top 10 would require a miracle. To find an answer to this complex issue, let us first see what Croatia has that India lacks. It was part of the East European communist bloc when part of Yugoslavia and that means it inherited a strong sporting legacy. The communist nations spent huge amounts of money in building a sporting ethos (the characteristic spirit of a culture, era, or community as manifested in its attitudes and aspirations) which aimed at winning international competitions. It was part of their huge propaganda machine that wanted to tell the world how strong they were as nation states; as good, if not better, than the capitalist regimes (system or ordered way of doing things). This also means Croatia has a better sporting infrastructure, though not as good as many European nations, but certainly far superior to what India has to offer its people. It may lag behind India in GDP numbers, but its average calorie intake is 2,900 kilocalories in comparison to India’s 2,360. The average height of a Croatian male is around 6 feet and for women it is 5.6 feet. The point of this comparison is to just show that a Croatian citizen is far better looked after, and when provided proper coaching, infrastructure and access to sports, the results are bound to be better. The Indian sports story is a long list of nepotism (the practice among those with power or influence of favouring relatives or friends, especially by giving them jobs), corruption, apathy (lack of interest) from the system and selfish federation officials who can’t look beyond their nose. The government spending on sports, particularly infrastructure, is abysmal, though in the last decade or so, it has woken up to the fact — as the erstwhile communist regimes did — that sport has tremendous propaganda value and fuels “nationalism” as nothing else can.